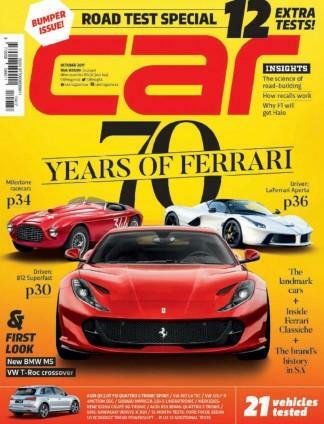 A subscription to Car magazine puts readers in the driver's seat of the most exotic and exciting new cars on the planet.Car magazine covers everything from definitive tests of the new cars you'll want to drive and own, to epic driving adventures across the most demanding roads in the world. Car provides the insight and opinion that will inform your view of all things automotive.Car magazine delivers true insight on the next generation of cars, sensational scoops and the inside story on the design trends, technology and people shaping your next car. Each issue features the best, boldest writing, and photography so captivating you'll struggle to turn the page. If you're an unconventional thinker who is fascinated by everything from supercars to city cars, and wants to access all areas of the car industry, subscribe to Car magazine today! A great all round magazine for the Australian market, a slight sneak peak of what is coming and what we don&apos;t get. Exceptional reading for anyone into European cars and limited information on lower quality Asian and American vehicles.